I was born in the English town of Basingstoke in 1944, but have lived in many parts of the world including Australia and the Far East ‑ and now home is ‘Corinthia’, an eighteenth‑century house (which we share with Chi and Ling, two very charming and naughty Siamese cats) in a quiet part of Devon. I wanted to go to sea ever since I can remember. My mother says that as a toddler I went up to sailors on the street, and on one occasion dragged home a dead sea bird because it smelled of the sea. 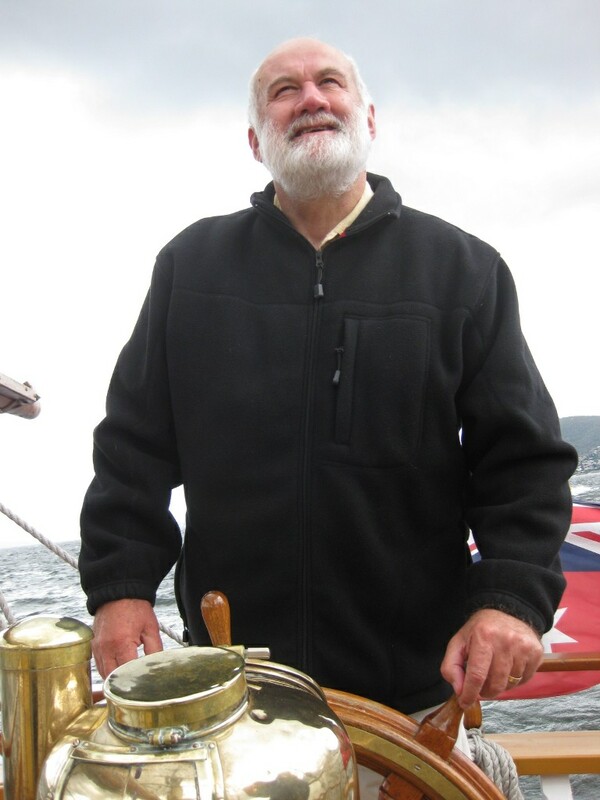 My uncle Tom Clay, a seaman in square-rigged ships who sailed around Cape Horn in the Cutty Sark, took me over his ship and also around the National Maritime Museum and was a great influence on me. (No one else in my family had any connection with the sea; my father served in the army during the war.) As a young boy I read everything about the sea, and was especially terrified by a description of a great storm, but longed to go to sea to experience a real one! I won a scholarship to a fine English grammar school, but my mind was captivated by seeing low grey shapes slip away over the horizon, outward bound to who knew where. I passed this sight every day on my way to school. My scholastic performance suffered. In the hope of having the nonsense knocked out of me my father sent me at the tender age of fourteen to the Indefatigable, a tough sea-training school. This only strengthened my resolve for a life at sea, and I joined the Royal Navy at 15. My family emigrated and I transferred to the Royal Australian Navy. I served there eight years, saw my great storm, and was eventually rated petty officer. In my naval career I saw service around the world, including the Far East and South Sea islands. In Vietnam I served in a carrier task force and was on board Melbourne at the time of the disastrous peace time collision with Voyager. Leaving the Navy was a wrench but I wanted to take up the education I had missed, a considerable challenge having no qualifications from school! Attending the University of Tasmania I graduated in Far Eastern studies and psychology (after what I had seen in the fo’c’sle of a warship, fascinating). After teaching for two years I practised as a psychologist. Then I met Kathy and we decided to seek adventure in Hong Kong. I initially did post-graduate work in cross-cultural psychology and in the process was seduced by computers. Disillusioned with academic life I became involved in the manufacture and design of computers and later software development. Meanwhile, Kathy’s career was developing as a journalist and we enjoyed the social life of a foreign correspondent. At this stage I renewed direct involvement with the Navy, being commissioned into the Royal Navy Reserve. I was honoured to be awarded an MBE and retired as Lt Commander. She saw my potential as a writer (where I did not) and persuaded me to give it a go. I took a half‑time job lecturing in order to devote time to absorbing the craft of writing. I’m ‘Old Navy’ with a deep respect and admiration for the service, so it had to be the Navy I’d write about. 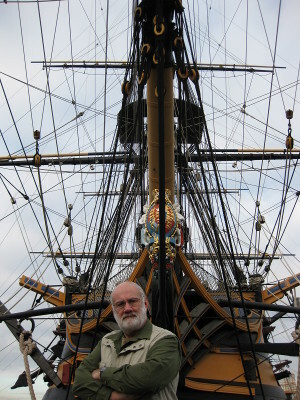 I chose Nelson’s time, the great climax of the age of sail and a magnificent canvas for sea tales. This was an era when the sea was respected and wooed by men who didn’t have steam engines and brute force. I also wanted to bring the sea itself into a more prominent role. Kathy’s skills as an editor were seminal in the process of my developing as a writer and finding a voice and we now work full time as a close creative team. As well as the latest book in the ongoing Kydd series, To The Eastern Seas, I’ve brought out another two historical action-adventure novels, The Silk Tree and The Powder of Death. I love the website and I have just started my first “Kydd” novel. I too love the sea however I get very seasick! My uncle and great-uncle were in the Royal Navy (my mother is from London, but I am American). One now lives in New Zealand and the other has passed away. The one that passed away was the captain of a ferry from Sussex to Amsterdam (the sister ship capsized in the 1980’s). So far I am really enjoying the book. Keep up the good work! Hello, Julian! I am counting down until October 1 — the day that “Inferno” might appear in bookstores in the US. Yes, I could have bout it in Kindle a few weeks ago, but, this time, I’d rather have The Real Book in my hands. On Saturday, I will harass my local bookstore! Less than four days! !